I wasn't certain where I wanted my quilting to go. I have read so many of your blogs and a great many of them seem to have set a plan or goals for 2012. I wasn't certain the direction to take. A friend recently pointed out an expression that says whatever you're doing on January 1st, you will be doing the rest of the year. If that is so, I will be practicing and experimenting more. As you can see from my side bar, I have taken the pledge over at SewCalGal's 2012 Free Motion Quilting Challenge. The first month's tutorial has begun and you can check it out here. 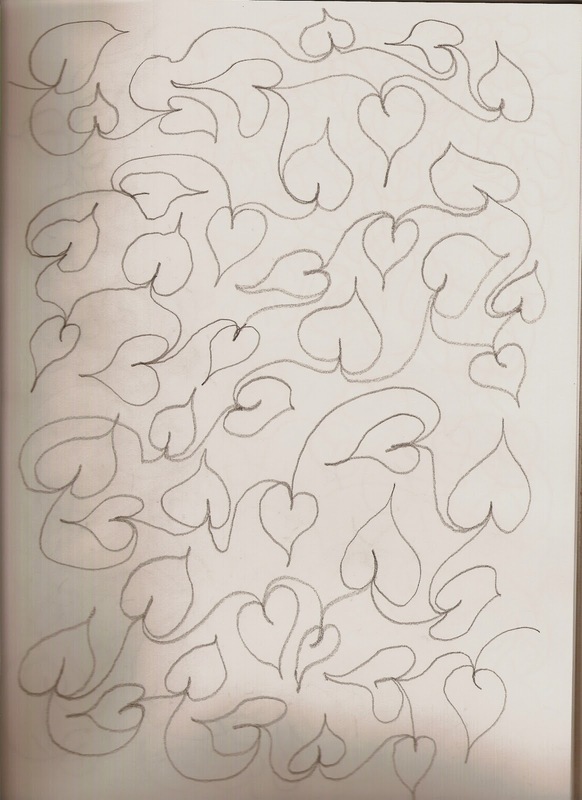 I've been practicing the design for the month by drawing it in my sketchbook to retain it to "muscle" memory. This is the drawing. I think I'm ready to attempt it on the sewing machine now. I'll post a picture later. I also want to sketch more. 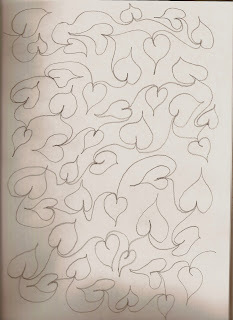 I've read that sketching, or in my case doodling, can be the germination of wonderfully creative ideas. Besides it's one more skill to add to my toolbox. With the FMQ and the sketching maybe I'll be able to finish some of my UFOs that have stalled. We shall see. LEAVES are great to start off with, if you add the line inside the leaf a little more like the vein it's a leaf, if you omit it, it's HEARTS :-) have fun with it! your leaves look great! Doodling is something I want to do more of this year, too!